Litronix, Inc., (Cupertino, CA) was an early light-emitting diode (LED) company that became a leading supplier of displays for handheld calculators and digital watches (e.g. the Hamilton Pulsar line). Litronix Malaysia Sdn Bhd located in Penang was established in March 1972 with 7-segment light-emitting diode (LED) displays as initial products. Within a few years, the company expanded its product base into LED related consumer products such as LED watches, calculators and LED games. 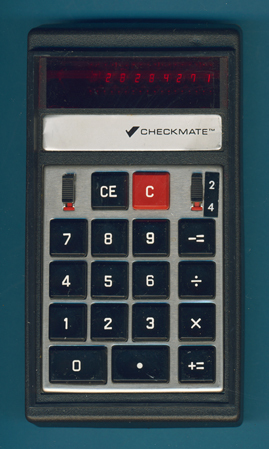 This rare Checkmate 1002 followed the original Checkmate and was the first portable electronic calculator developed and manufactured by Litronix in their Malaysia facility. It is one of the rare designs using the original Klixon™ keypad without the TMS0100 MOS/LSI calculator-on-a-chip. Collectors - if you know anything about the Integrated Circuits found in the calculator - please drop me a line. No doubts that Litronix manufactured the used display modules by themselves. Don't miss the first portable electronic calculator, the famous Bowmar 901B. © Joerg Woerner, October 24, 2002. No reprints without written permission.